Kiss, a play produced by ArtsEmerson, features student actors who rehearse 30 hours a week. Kiss, a play produced by ArtsEmerson, features over 20 Emerson student actors, designers, and managers. But the play also includes one professional actress. An audition notice posted on Broadway World listed her pay as $568 a week. All the students involved with Kiss are working unpaid. Last month, musical theatre major Daniel Klingenstein posted in an Emerson Facebook groups asking why student actors in Kiss were not getting paid. The senior said actors working professional hours beyond a work study’s legal limit deserve payment. Emerson policy dictates that students employed by the school cannot work for more than 20 hours per week. According to Kiss stage manager Sammy Landau, the actors who are not employed by Emerson rehearsed 30 hours a week with seven-hour rehearsals on Saturday and Sunday. Mondays were their only day off. Senior Ashley Renee Dixon, a theatre and performance major, is one of the actors who plays Hadeel in Kiss. She said the actors were notified of the time commitment and lack of pay before they accepted their roles in late April. Melia Bensussen, the chair of the performing arts department, said all students had the opportunity to receive college credit for working with ArtsEmerson. She said co-productions are intended as an educational opportunity. Emerson Stage, the producing and presenting organization within Emerson College’s performing arts department, is an educational platform for performing arts majors to produce and perform theater. ArtsEmerson only features students in certain shows depending on the needs of its productions and touring shows. It is an organization of the office of the arts. Although ArtsEmerson is a producing and presenting organization, the organization primarily presents touring companies. Emerson Stage productions rehearse for two to three months and student actors work 20 hours a week with Fridays and Saturdays off. The shows are performed for one or two weekends, and students also work unpaid. Although ArtsEmerson schedules vary with each production, Kiss rehearsals lasted for four weeks, and there will be 19 performances. Klingenstein said even Emerson Stage productions were difficult to manage on top of his five courses. “I would hope that ArtsEmerson—if they are going to work with students in the future—would try to adhere to the same standard of work in terms of their ethic and their timing to what Emerson Stage does,” Klingenstein said. Bensussen said she hopes students will be able to participate in ArtsEmerson productions every year. Not many colleges partner with professional theater companies. But the Wheelock Family Theatre, a department of Wheelock College, is run similarly to ArtsEmerson. According to Nick Vargas, associate artistic and education director, Wheelock considers performances as an educational opportunity, and students may obtain course credit but are not paid like equity actors. Wheelock is a non-profit professional theatre. Administration could not be reached to comment if ArtsEmerson generates a profit for the college, but the company is under the same 501(C)(3) tax exemption as Emerson College. Alternatively, students at Kean University in New Jersey can act for Premiere Stages, a professional theater company in residence at the school and in partnership with the Kean University Theatre Conservatory. 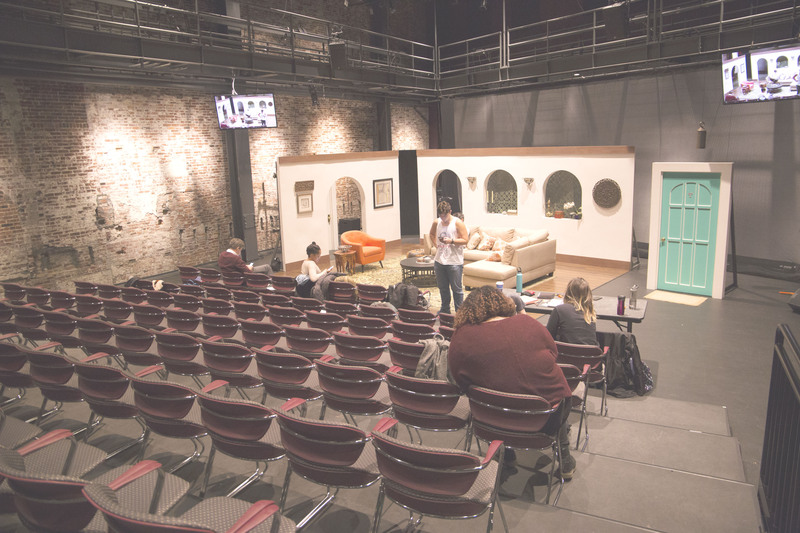 According to producing artistic director John Wooten, students are paid a stipend for their work as administrative assistants, understudies, and actors when non-equity roles are available. Dixon said she was just grateful to act in a professional setting, and she was excited to perform a show for longer than a few weekends. David Dower, a co-artistic director for ArtsEmerson and the chair of theater management and production, is the director of Kiss. He said using students allowed him to cast the main five actors as well as understudies who get to perform on certain nights, instead of only hiring five professionals without understudies. He noted the performers had the opportunity to work with Kiss playwright Guillermo Calderón. Dower questioned why concern over actor payment arose last month, since student designers and stage managers who have worked with ArtsEmerson in the past have gone unpaid. According to Bensussen, students have worked with ArtsEmerson in various productions since 2011. Cafe Variations (2012), a co production with Emerson Stage and SITI Company, occurred instead of Emerson Stage’s Spring Musical. Landau, the stage manager for Kiss, was also the production assistant for Breath and Imagination in 2015. The stage and production management major said they appreciated the opportunity to work with ArtsEmerson, since stage and production majors are required to work on an Emerson production at least once a year. The senior said although they had the financial stability to work for free, many students sacrifice sleep to accomplish extracurriculars. “The school cultivates this culture of shaming people that have to work because they can’t financially support themselves otherwise, and that’s really not a good thing,” Landau said. Dixon said she knew peers who turned down roles or who were unable to audition in the first place because they knew the commitment would prove too costly. “I think it’s really administration and the higher-ups turning a blind eye on the needs of students who we all should be making a chance for, not just for this show,” Landau said. Kiss is about a young American theater group producing what they believed to be a Syrian soap opera, only to discover how much they got wrong. It runs from Oct. 26 to Nov. 19 at the Jackie Liebergott Black Box Theater in the Paramount Center.